Presentation of award to Robert Fischell. 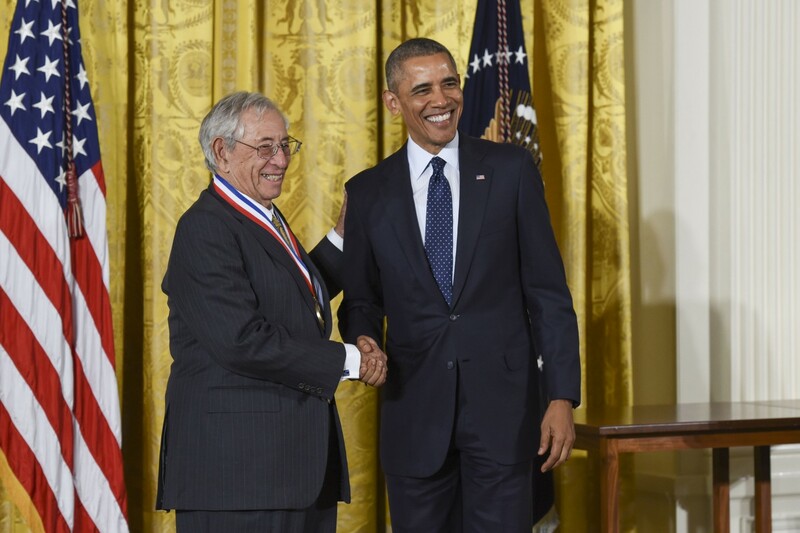 At the end of last semester on May 19, 2016, University of Maryland Professor of Practice Dr. Robert E. Fischell was recognized by President Barack Obama as a recipient of the highest honor for technological achievement bestowed by the White House, the National Medal of Technology and Innovation. The awards ceremony took place at the White House and was covered by several news agencies; I have provided the following links to the Clark School news story and to a comprehensive, endearing, and even witty 11-minute interview by ABC News’ Alex Mallin (http://www.eng.umd.edu/html/news/news_story.php?id=9495; http://abcnews.go.com/Health/video/meet-87-year-genius-inventor-credited-saving-millions-39237985). I was invited to prepare these few words for the Faculty Voice so that our campus community might learn a bit about Bob and the impact he’s had on the campus, which might not otherwise be covered in newscasts. Bob has so many inventions, they’re difficult to count. He holds more than 200 U.S. patents, ranging from implanted infusion pumps to drug eluting stents. His educational background includes a B.S. in mechanical engineering from Duke and an M.S. in physics from the University of Maryland. Bob is one of Maryland’s few honorary doctorates, a recognition bestowed by Brit Kirwan in 1996, linking him with notables Ira Gershwin, Herbert Block, A. James Clark, Katherine Graham, Jim Henson, Andrew Wyeth, and Roald Hoffmann, to name a few. Perhaps Bob’s association with these others was envisioned by Brit Kirwan two decades ago! One could argue that Bob Fischell exhibits traits of each, even Gershwin who, with his brother George, is among Bob’s favorite songwriters. Bob’s appreciation for music and the arts is accompanied by his talent: he played the Sergeant of Police in Gilbert and Sullivan’s The Pirates of Penzance at the Clarice Smith Performing Arts Center in 2008! In the early 2000s, Bob Fischell generously endowed the Fischell Graduate Fellowship in Biomedical Engineering at the University of Maryland. Its first recipients were selected based on their desire and promise to create innovative device solutions for human health challenges. Even with this high bar of expectation, several fellowship recipients have done just that – created device-based solutions to health problems. Bob has been generous with his guidance, so perhaps success could have been envisioned. Around the same time Bob endowed the fellowship, our campus had established a task force with an objective of growing our research portfolio with the National Institutes of Health. One of the outcomes of the study was the interdisciplinary Graduate Program in Bioengineering, which over the ensuing years succeeded in growing enthusiasm for developing research and education programs at the interface between the biological sciences and engineering. The requisite thought processes had already been seeded in the Departments of Biological Resource Engineering and Chemical Engineering. Of critical importance at the same time, then Dean Nariman Farvardin had invited Bob to what he later referred to as “the most expensive free lunch he’d ever had.” This lunch precipitated plans for the Fischell Department of Bioengineering and the Robert E. Fischell Institute for Biomedical Devices. That is, through their generous philanthropic support, advice, and infectious enthusiasm, Bob and Susan Fischell together with sons David, Tim, and Scott were instrumental in the establishment of the Fischell Department of Bioengineering. Since the department’s inception in 2006, our campus has seen tremendous growth in bioengineering research, education, and innovation. Fischell Department graduates are getting fantastic jobs, and its faculty members are innovating new therapies and devices aimed at enhancing human health. This year, our campus will establish the Robert E. Fischell Institute for Biomedical Devices, completing plans put in place a decade ago. Parenthetically, we had not even envisioned Clark Hall until 2008, when it became obvious that student numbers had already outstripped capacity. At present, there are approximately 80 Ph.D. students, more than 450 undergraduates, and 28 faculty and staff members. Back in 2006, Bob was likely more interested in solving human health problems by developing new biomedical devices than creating a department, but the students and their education came first – the challenges of creating new devices through the establishment of the Institute were put on hold. Campus resources and space weren’t available for both the department and the institute. All along the way, however, Bob was developing new concepts, creating new devices, solving many health problems. He’s not one to pause and relax, especially when there are ideas that can be developed into solutions. Even at 87, Bob works about 10 hours a day. His three most recent patents were all awarded in the past three years! During the last decade, Bob’s migraine headache device went through clinical trials, and was cleared by the Food and Drug Administration; today, it is heading to the marketplace via eNeura, Inc. Bob’s companies, NeuroPace, Svelte, Angel Medical Systems, and others have grown, all nurtured by the ever-interested, ever-enthusiastic, and ever-motivated Bob Fischell. Perhaps Bob’s greatest contribution will be a pain-abolishing device being developed by Zygood, Inc., in partnership with the University of Maryland. Importantly, the Zygood device is about to undergo its first human clinical trials in the University of Maryland School of Medicine. It is only fitting that, with our state leadership’s commitment to fostering linkages between the University of Maryland, College Park, and the University of Maryland, Baltimore, we turn to one of our foremost technological and societal leaders, Bob Fischell, to guide the way. Congratulations to Bob Fischell on being awarded the National Medal of Technology and Innovation!